I got one for Christmas and it rocks! Real R/C (not infra red controlled) with Camera and Stunt mode. Insert a Micro SD card into the slot, charge up the battery (usb charger included) and off you go. You can record Video or Still pictures using the controls on the remote (you can turn them on and off). Check out the video it took from in front of my house. Put it in Stunt mode and do flips and barrel rolls with the flick of the controller. For being so small it's very stable and easy to fly. One thing I will add though. It records audio and I have no idea why because all you can hear is the sound of the blades humming. I turned down the volume on the video I recorded because you would not believe how loud it was on the recording! 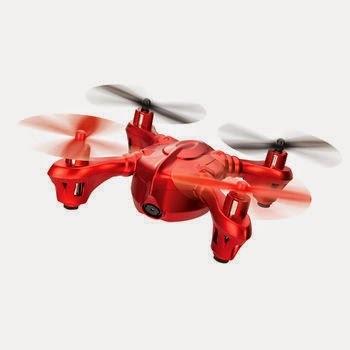 By simply using the best jingle you can certainly create the best video for you and your family during the joyful vacation, the mini air drone is the best device for everyone to help make the video and photo of different moments. From the minds of Loosenuts.com. Awesome Inc. theme. Powered by Blogger.